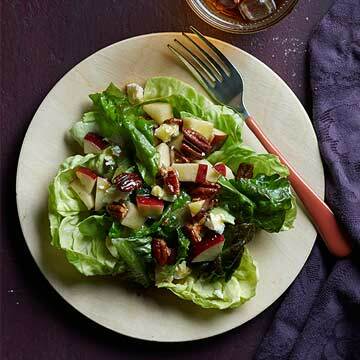 Cinnamon and cayenne pepper coat the baked pecans that top this fruit and feta cheese side salad. For pecans: Line a 15x10x1-inch baking pan with foil. Spread pecans in an even layer. In a small saucepan, heat and stir butter, cinnamon, salt, and cayenne pepper over low heat until melted. Drizzle butter mixture over pecans; stir gently to coat the nuts. Bake in a 350 degree F oven for 10 to 15 minutes or until pecans are golden brown and aromatic. Cool in pan on a wire rack. For vinaigrette: In a screw-top jar, combine oil, vinegar and mustard. Cover and shake well; set aside. Core and chop the apple; place in a large bowl. Sprinkle lemon juice over apple; stir gently to coat the pieces. Add leaf lettuce and feta cheese to apple in bowl; toss to combine. Shake vinaigrette; drizzle vinaigrette over salad. Toss to coat. Line salad plates with Butterhead lettuce leaves. Top with salad mixture. Top with spiced pecans and sprinkle with cracked black pepper, if you like.